University of Maine's Blanca Millan looks to pass around Hartford defender Ella Awobajo in the first half of Friday night's game. 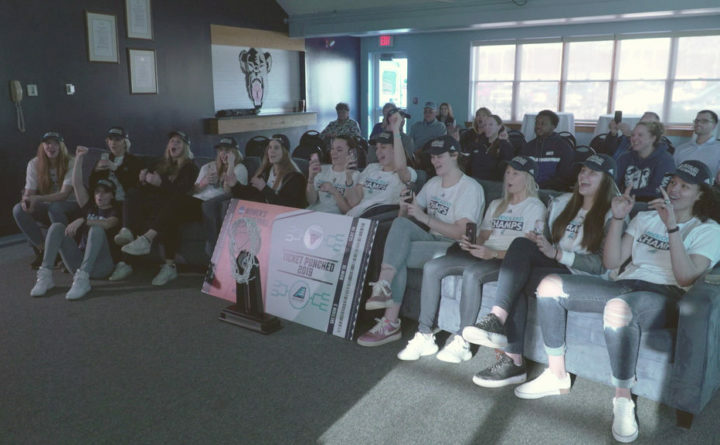 The University of Maine women's basketball team reacts when finding out it will play North Carolina State at 1 p.m. Saturday in the first round of the NCAA tournament. The Black Bears faced the Wolfack earlier this season and lost 84-46. 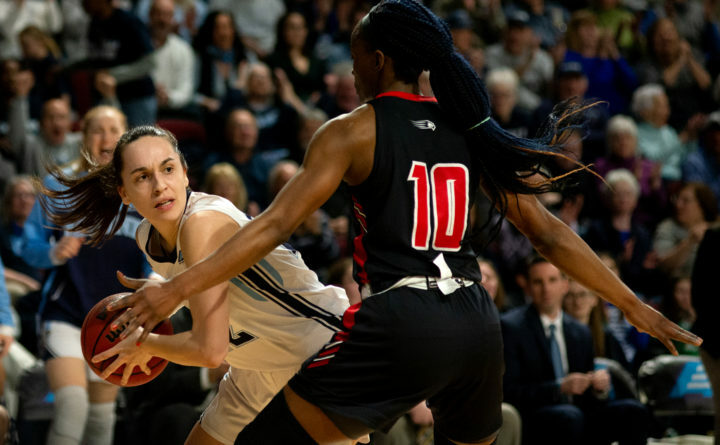 The University of Maine women’s basketball team will play a team it has already faced this season in the NCAA tournament. Coach Amy Vachon’s America East champion Black Bears, 25-7 and a No. 14 seed, travel to Raleigh, North Carolina, to face No. 3 seed North Carolina State (26-5) at 1 p.m. Saturday. North Carolina State beat the Black Bears 84-46 in Raleigh on Dec. 15. “We’re really excited. It doesn’t matter who we play,” said UMaine senior Tanesha Sutton, who posted a team-high 16 points, three assists and two steals in last year’s loss to Texas. In the other matchup in Raleigh, sixth seed Kentucky (24-7) takes on No. 11 Princeton (22-9) at 11 a.m. The winners play Monday. UMaine enters the game with a 14-game winning streak. The Black Bears earned a No. 14 seed despite posting 25 wins and checking in at No. 54 in the most recent Rating Percentage Index compiled by the NCAA. UMaine plays in America East, which according to warrennolan.com ranks 23rd among the nation’s 32 Division I conferences this season. This will be the second time a UMaine team has traveled to Reynolds Coliseum for an NCAA tourney game. The Wolfpack beat UMaine 89-64 in 1998 in what was Cindy Blodgett’s final game for the Black Bears. The brackets were released two hours early Monday because ESPN mistakenly published the brackets prematurely on ESPNU. So the NCAA women’s tournament selection show aired at 5 p.m. on ESPN2. ESPN also aired the show at 7 p.m. to honor its original commitment. ESPN released a statement apologizing to the NCAA for the error and the women’s basketball community and said they will conduct a thorough review of the process to make sure it doesn’t happen again. This is UMaine’s ninth NCAA tournament appearance and its second in as many seasons. The Black Bears lost to Texas 83-54 last season in the first round of the tournament in Austin, Texas. “Any time you’re still playing in March and going to the Big Dance to play a team you know, it’s exciting,” said UMaine graduate student Parise Rossignol from Van Buren. “They’re obviously a good team, but we’re a different now than we were back then. “They didn’t get our best shot. We didn’t play well and we didn’t have Fanny [Wadling]. That’s huge for us. She’s an inside presence,” Rossignol said. The 6-foot-2 Wadling is UMaine’s leading rebounder, averaging nine per game. She missed the N.C. State game among 10 she sat out due to a concussion. In UMaine’s loss at North Carolina State, the Wolfpack outrebounded UMaine 50-26. “She’s one of our best rebounders and rim protectors, and to have her playing is really good for us,” Sutton said. While the Black Bears are healthy, the Wolfpack lost junior guard Grace Hunter for the season in January with a torn anterior cruciate [knee] ligament suffered in a victory over Duke. Hunter was North Carolina State’s leading scorer at the time at 14.6 points per game. She was also averaging 6.9 rebounds and 2.9 assists. Hunter contributed 10 points, five assists and three rebounds against UMaine. Sutton and Rossignol said they like the idea of playing someone they are familiar with and in a facility they have played previously. “They played real well against us, and we didn’t play well but a lot of that had to do with NC State,” Vachon said. “They’re a really talented team and it’s going to be a good challenge, but it’s one we’re really excited for. UMaine shot 27 percent from the floor (17-for-63), while North Carolina State shot 58.9 percent (33-for-56). UMaine is 1-8 all-time in the NCAA tournament. The only win was a 60-58 triumph over Stanford in 1999 at Old Dominion University in Norfolk, Virginia. Vachon had 11 points and seven assists in that victory. Host Old Dominion University ousted the Black Bears 72-62 in the next round. UMaine played in its first NCAA tournament in 1995, losing to the home-standing University of Connecticut Huskies 105-75 in Storrs, Connecticut. UMaine has also lost to George Washington (1996, 83-67), Louisiana State (1997, 88-79), North Carolina (2000, 62-57) and Texas Tech (2004, 60-50) in addition to North Carolina State, Old Dominion and Texas.